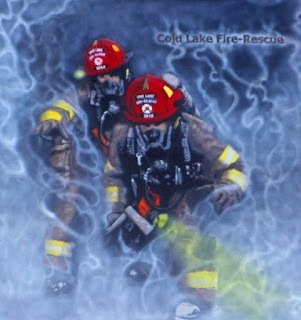 "Tutoribus" - a painting by Cold Lake firefighter Jason Spears, which was unveiled at the Cold Lake downtown fire hall grand opening on July 9. The local superheroes have got a new command centre. Cold Lake Fire Department held a grand opening for its new, state of the art fire hall with a full house on July 9. The celebration comes after 16 months of construction and years of planning for the mostly volunteer-driven fire department. Construction of the $8.5 million fire hall was completed in May and has been operational since June 1. The hall is not just a fire hall. While the fire department has the front bay, the rear bay is devoted to Cold Lake Ambulance Services, which houses several vehicles. Fallow added that the station would allow for future growth of the fire department, which is growing as fast as the city itself. While there is no immediate plan to move to a full-time paid fire department, Mayor Craig Copeland said in a speech that the city is expecting to need one eventually. Currently Cold Lake Fire Department has three fulltime employees and about 60 paid on-call firefighters. The department serves the City of Cold Lake, Cold Lake First Nations and the MD of Bonnyville, as well as having the occasional call into Saskatchewan. The hall includes dormitory spaces for both firefighters and EMS personnel, as well as a full kitchen. It also features one of the tallest towers in the city, which will be used for training. Finally, the hall features a special Emergency Operations Centre in case the City of Cold Lake ever needs one, in the event of a major catastrophe the centre will act as the headquarters. Another prominent feature of the new hall is a large painting designed and painted by firefighter and artist Jason Spears. Operating completely under Fallow's nose, Spears spent 14 months painstakingly drafting, sketching and painting the piece, called “Tutoribus”, oftentimes having to wait until after midnight to sneak in and work on the surprise piece without his chief noticing. Spears' work paid off – the painting was revealed to a wide-eyed Fallow, who was so moved by the gesture he was holding back tears of joy. “I had no idea this was going to happen,” expressed Fallow with a deep breath. The idea to create a painting was a no-brainer for Spears. He noted that his primary drive to finish was to do something for his fellow firefighters. Click the image above to view my printable portfolio - I update the portfolio regularly, so check back often. You will have to download the pdf to view the video. Can Muriel Lake be saved?